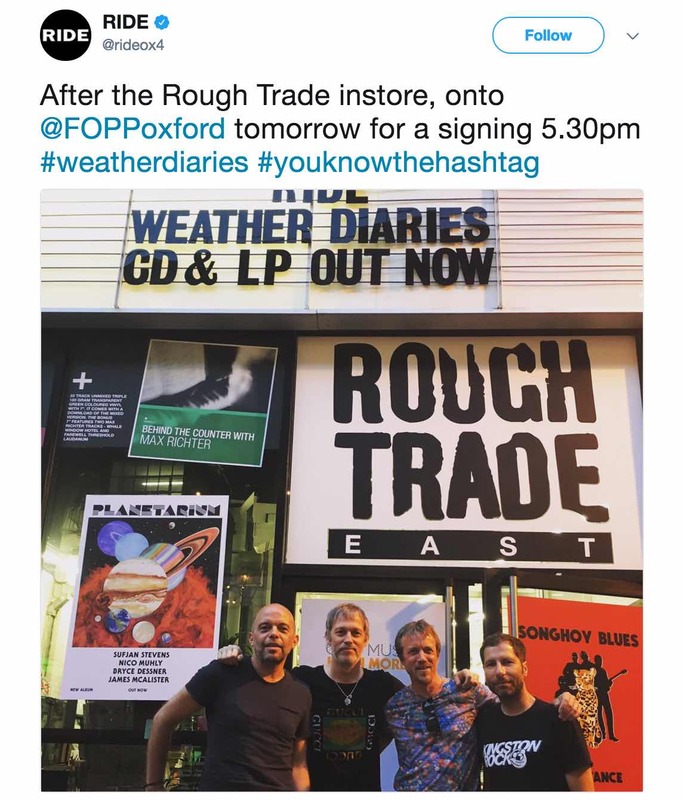 Free wristband given to anyone who bought Weather Diaries at Rough Trade. 6.30pm Doors // 7.00pm On-stage // 7.45pm Signing // 9.00pm close. Band had false start on stage as Lannoy Point was originally due to be opening track. 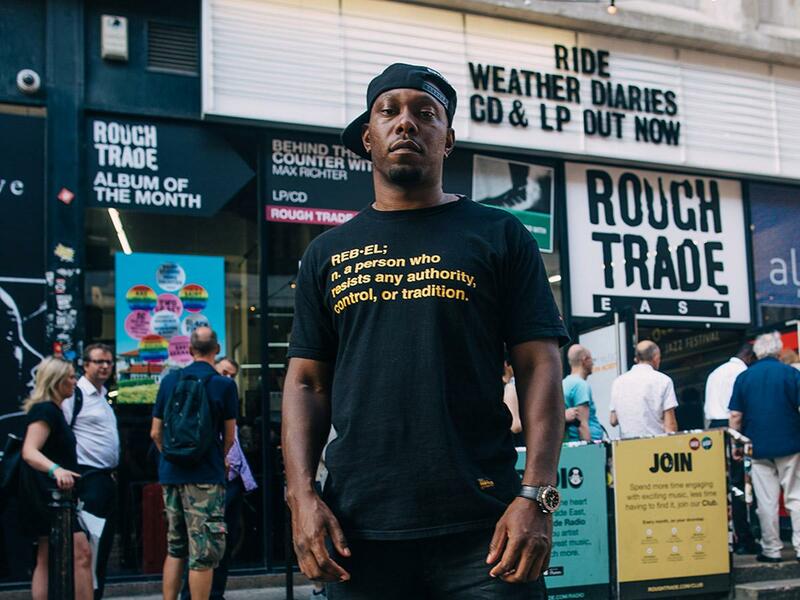 Dizzee Rascal was doing a photo shoot that evening outside the store. It was their 20th anniversary reunion tour that made the quartet ponder deeply about a return to the studio, but it didn’t take much calculation. The tunes just started pouring out of them. As soon as the four made the announcement that they were getting the band back together to play a series of shows in 2015, they decided to check into a studio – to rehearse, of course. 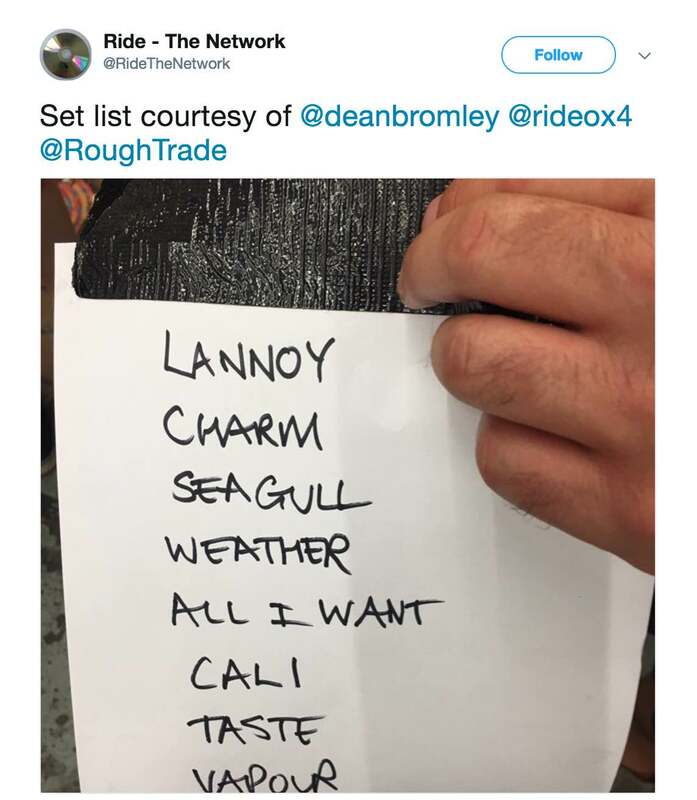 The songs on this year’s ‘Weather Diaries’ – their fifth record – date back in part to musical ideas forming as far back as then. According to Mark, they didn’t do as much rehearsing as they initially anticipated. “As soon as we’d spend time together in a room, relearning the old songs, we’d find ourselves jamming, playing new things. We’re still music enthusiasts, just vibing. We went a bit off course. In a good way, ha!”. Once touring had taken up the whole of 2015, the four concentrated their entire 2016 on solidifying ideas and recording. All four members have contributed to the writing of ‘Weather Diaries’. Fragments of studio and soundcheck jams provided initial ideas. Steve Queralt brought in two backing tracks which became essential to the album, for ‘Lannoy Point’ and the title track. Loz Colbert brought in a fully formed song, ‘Rocket Silver Symphony’, which he also sings lead vocals on. Andy Bell took his traditional central writing role in the band, with Mark Gardener providing melodic vocal ideas to several of the tunes as well as coming up with the melody and lyric for Steve’s ‘Lannoy Point’ and also ‘White Sands’, the album’s closing track. For Steve who hadn’t played music for 20 years, it was the biggest relief to be back in the studio having built that confidence back up on the road. “When we first agreed to play five dates, I was hugely excited but that was followed up by a crushing anxiety,” he says. After all four of them had worked on material separately, they met up in July 2016 to rehearse what they’d conjured. “It did bring us back!” says Andy, commenting that it felt like the old days all over again, reminding him of when they’d rehearse at the Mill Art Centre in Banbury. “There’s a strong chemistry that’s always there,” adds Mark. Once key decisions were made, Andy and Mark spent time together as a duo, structuring the songs, laying down vocals back in Oxford, whereas Steve and Loz hunkered down to work on rhythm and arrangements. The next step was to figure out producers. Surprisingly perhaps they brought dance maestro Erol Alkan and (perhaps less surprising) rock legend Alan Moulder on board. Erol was someone Andy knew socially. Mark found the suggestion most odd at first, being initially aware of Erol’s work as a DJ and remixer. He learned of Erol’s history producing straight-up rock outfits such as Mystery Jets and Late Of The Pier and his studio skills. But it was his further electronic work that eventually inspired the kindred connection. “I scratched a bit deeper and listened to ‘Bugged In’ and ‘Bugged Out’, which led me onto buying the ‘The Soft Bounce’ album.” That latter psychedelic-leaning record from ‘Beyond The Wizards Sleeve’- Erol’s side project incorporating a variety of production styles; slowing down tapes, hypnotic rhythms and washes of lush guitars incorporating a distinct shoegaze atmosphere. Suddenly everything clicked for Ride. 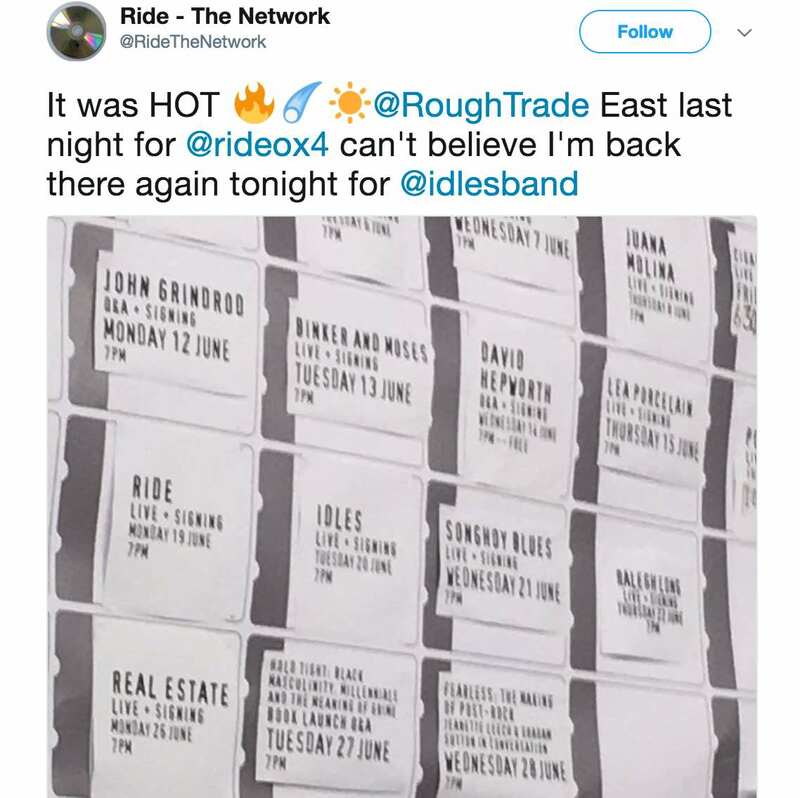 Erol, a long-standing fan of Ride, remembers seeing their reunion show at the Roundhouse in London. “They sounded better than I’d ever remembered,” he says. “Powerful, melodic, all the things I love about guitar music – its intricacies, its simplicity. They’re truly timeless.” Slightly cautious of doing a record with them, he requested demos. “I wanted to do this for the right reasons, to do this the same way I would if it was a debut for a brand new band,” he says. Fortunately he was hit by a cavalcade of tunes demonstrating that same knack for brilliant songwriting, arrangement and rhythmic tricks that he fell for as teenager. Soon he was locking himself away in a big house for 17 days over the course of a few weeks in Pershore, near Worcester. Together they worked in a residential studio with zero distractions. “The tracks are among the best things they’ve recorded,” says Erol. From the huge sonic storm at the end of ‘Weather Diaries’ to the addictive verses of ‘Cali’, the material is as Ride as ever, yet written from the vantage point of men who have experienced life’s trials and tribulations. Lead single ‘Charm Assault’ captures you with its catchy riffs and pressing lyrics – an expression of disgust at the current state of affairs in the UK, written as a response to Brexit. “I just write lyrics that naturally occur to me,” says Andy, offering that he’s not going out of his way to be overtly political. That said, there’s an anger at society that comes out in the sprawling opening track ‘Lannoy Point’ and in ‘All I Want’, the latter exploring the idea of Britain aping 1930s Germany over cascading drums and multi-layered vocals. Perhaps the one song they wouldn’t have been able to write 21 years ago is ‘Impermanence’, which deals with death and bereavement. The lyric is Andy’s, written about a friend who died from a brain tumour last year. “There’s something permanent about impermanence,” he explains. “Something constant about the fact that we are ephemeral, that it’s a law of nature that everything does go away. When you’re trying to get over losing a friend you have to remind yourself that it’s just a change into a different form. You have to look at the bigger picture.” Mark related to it as someone who’s suffered the loss of both parents in the last few years. “It made it extra cathartic for me as well,” he offers. Revived and rejuvenated, the foursome are railing to play the new songs live and reach the heights of what they do best – recreating those swirling hedonistic palettes of sound before an audience of old and new fans. “Our relationship feels stronger than it ever because of everything that’s gone on before,” says Mark. “We’ve all grown up. We’re much better at saying when things aren’t right. For me, having lost family, the band is a family that I still have, a family I’ve had from school days till now. I don’t see that changing whether we’re doing music or not.” Elated with the results of their labour, Ride aren’t piling unnecessary expectant pressure on themselves. For Loz “it feels like a debut in some ways.” ‘Weather Diaries’ has taken them to new future avenues via a heady trip down memory lane. They’re not getting off this train any time soon.